This command was then carried on throughout all the history of Islam. 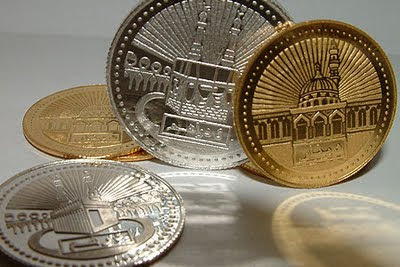 The dinar and the dirham were both round, and the writing was stamped in concentric circles. Typically on one side it was written the "tahlil" and the "tahmid", that is, "la ilaha ill'Allah" and "alhamdulillah"; and on the other side was written the name of the Amir and the date. Later on it became common to introduce the blessings on the Prophet, salla'llahu alayhi wa sallam, and sometimes, ayats of the Qur'an. "The benefit that can be taken from this is the prohibition of entrusting the People of the Book with goods". Qadi Abu Bakr said: "The question concerning entrusting property is legislated by the text of Qur'an." This means that the ayat is a legal judgement of absolute validity and of the greatest importance to the deen.